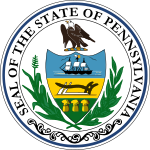 The 1926 United States Senate election in Pennsylvania was held on November 2, 1926. Incumbent Republican George W. Pepper, who was appointed following the death of Boies Penrose, was defeated for re-nomination by William Scott Vare. Vare won the election, defeating Democratic opponent William Bauchop Wilson. He was not permitted to assume office, however, until an investigation was conducted into possible election fraud and corruption. Vare was ultimately unseated in December 1929 by the Senate, following charges of corruption. ^ a b "PEPPER, George Wharton, (1867 - 1961)". Biographical Directory of the U.S. Congress. Retrieved 4 July 2012. ^ "VARE, William Scott, (1867 - 1934)". Biographical Directory of the U.S. Congress. Retrieved 4 July 2012. ^ "Statistics of the Congressional Election of November 2, 1926" (PDF). Office of the Clerk of the U.S. House. Retrieved 8 July 2014.